With one daughter married and now living several hours away, and daughter number two in college two hours way, Lady Suzanne and I are now officially "empty nesters." And what do "empty nesters" do first? While cleaning the mountains of papers and books that I have (had) stacked in our office, I came across one of my favorite spiritual and inspirational books. A book so important and life-changing that I believe it must be required reading for every young person on this planet. 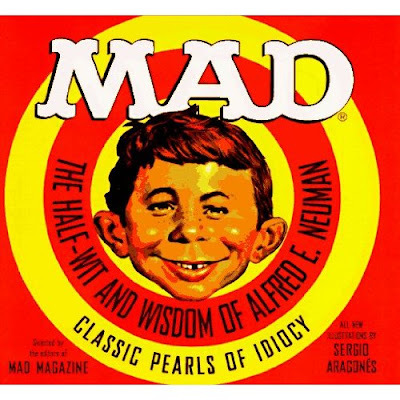 Mad's The Half-Wit and Wisdom of Alfred E. Neuman. It's a good idea to keep your words soft and sweet because you never know when you'll have to eat them. If at first you don't succeed... you're about normal. Modesty is the art of drawing attention to whatever it is you're being humble about. America is the land that fought for freedom and then began passing laws to get rid of it. These days, the only time politicians are telling the truth is when they call each other a liar. We're living in an age when lemonade is made with artificial ingredients and furniture polish is made with real lemons. Some people are like blisters: they show up right after the work is done. The dollar will never fall as low as some people will do to get it. A masochist is one who paints himself into a corner and then applies a second coat. It's not just the ups and downs that make life difficult, it's the jerks! Live every day as if it were your last, because one of these days you'll be right! excellent excellent... those gave me a real chuckle first thing this morning.....while you were all snoring in your empty nests. nothing like fitting in a new/old piece of the jigsaw into your life before that last day. I wasn't allowed to buy Mad magazine when I was a young 'un, but my cousin was and he would save them for me all year and give me a big stack all at once which I would read over, and over, and over. A couple years ago, watching Midnight Cowboy for the first time, I kept saying to the hubs, "I know I've never seen this before, but it's all so ridiculously familiar." Then I realized I'd read the Mad spoof over, and over and over. While silly, it was true enough to form that the actual movie had a sense of familiarity. If you go searching for MAD -- make sure that they are the older old. MAD sold out a few years ago (Warner Bros? maybe?) Anyway, never been the same. Lady T -- LOVE the "fold on the dotted lines" line. Excellent Blog Sir B! Alfred E Newman for President I say! Yeah, I loved the "fold on the dotted lines" Lady T! We're all so damn witty! LOL! But not quite as witty as the old Mad Mag was. I really love and have experienced so many times the...."Modesty is the art of drawing attention to whatever it is you're being humble about."